It is a crippling, relentless condition which often leads to immobility, horrible drugs, and frequently due to falls and their complications in the elderly – death. Your bones start to lose density at the age of 25 when they have reached their peak, so keeping your bones strong throughout your life is very important. By building muscle and bone density, you can reverse osteoporosis, and live a long, healthy life, but clearly you have to start now. Improvement can begin to show in as little as 12 weeks. Conventional treatment involves drugs which mask the problem and cause others. Instead by supporting the body, you will both prevent and if need be, reverse this crippling condition. Healthy diet – eat enough PROTEIN. This is KEY to prevention. A high protein diet powerfully prevents osteoporosis, not what the scaremongers would have you believe. 50% of your bone is made of protein – eat grass-fed meat, wild-caught fish, pastured eggs and poultry and cheese. Natural progesterone cream applied to the skin has been shown to increase bone density owing to the effect the hormone has in stimulating the bone building cells in bones. 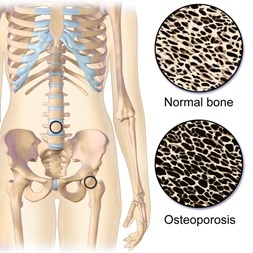 These cells are activated by progesterone from the ovaries in pre-menopausal women but once the ovaries stop making progesterone each month this bone maintenance effect is removed. See my Progesterone Blog for information on the use of natural progesterone cream. When bones are deficient in collagen, their frame is not strong enough for calcification to occur, so taking calcium simply doesn’t work. Clinical work shows that hydrolyzed collagen is so integral to bone health it dramatically improves bone density very quickly. Bone broth does not aid the bones specifically because it contains calcium, as many erroneously think – neither bone stock nor collagen obtained from land animal sources are ample sources of calcium!! So it’s not the calcium that is doing it – it’s the unique nature of the amino acid makeup which is responsible for bone-building, we don’t need any extra calcium. Pure Hydrolyzed Collagen is more important than any other protein for joint and bone health as it contains THREE times more of the amino acids glycine and proline. It is specifically these two amino acids that are not only responsible for the super strong three dimensional conformation of collagen, but also the ones that support the stability of collagen structures in cartilage. In vitro studies show that adding hydrolyzed collagen to a culture medium of chondrocytes (healthy cartilage cells), significantly provides a dose dependent increase in collagen type II synthesis. Taking Pure Hydrolysed Collagen (type I & III) will result in the stimulation of type II collagen – it’s a win-win for your bones, cartilage and purse. Because collagen makes up 90% of organic bone mass, by taking just 10g a day (1 tablespoon) of Pure Hydrolysed Collagen, within 4-24 weeks (according to studies), your bone density appears to increase dramatically! Pure Hydrolysed Collagen is the most marvellous antidote to osteoporosis and osteopaenia as shown in both clinical and experimental studies. The reason Pure Hydrolysed Collagen is so effective for those with arthritis and rheumatic pain is that it is also a very powerful anti-inflammatory agent. Sometimes older people suffer from arthritis and rheumatic pain in the hips, but by taking1-2 tablespoons of Pure Hydrolysed Collagen regularly, pain will be a thing of the past. You may get all these products from my shop – and have them couriered to your door.